Friedrichshain is a vibrant district and home to everything from hipster cafés, Bitcoin enthusiasts to entertaining bars. Friedrichshain changed a lot during the last years. With new bars opening all the time, it is sometimes difficult to find a needle in a haystack. To ease your decision, here are my Top 5 bars of Friedrichshain. A new trend in the last two years emerged at Holzmarkt, an outdoor space with studios, apartments, shops and of course a beer garden. It’s right by the Spree, next to the Berlin Wall. 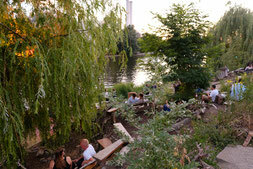 There are wooden benches where you sit and watch the river go by against the backdrop of the Fernsehentürm (TV Tower). And if you like the view, you’ll also enjoy one of the most beautiful sunsets in Berlin. Apart from delicious beers and Radler (typical german beer blend with lemonade), you can also find pizza and burgers. 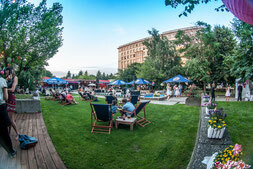 James June Sommergarten is a beautiful and really green beer garden in the centre of berlin where you can enjoy unpasteurized and unhomogenized tank beer Pilsner Urquell in a cozy atmosphere. In this star of Friedrichshains cocktail firmament you will find a delightfully cluttered ambiance and a convivial vibe. The folks behind the bar mix their cocktails with confidence, be it to create classics or their own creations. In Fitcher's Vogel, the most colourful birds compete with each other and drink delicious homemade beer. On some days the pub jungle is particularly noisy, because then you'll be called to the legendary music quiz! So don't be surprised if you visit this wonderful bar and listen to a different song every second. This bar provides an antidote to the sugar rush excess of Friedrichshains tourist spots and is stuffed with comfy sofas on which you can throne with a delicious drink in your hand. The ambience is relaxed and friendly and the cocktails a cut above what you normally get in Friedrichshain.